I hope someone released the entire performance of this on vinyl. its out on CD but not on vinyl. It take guts to perform infront of the most harsh nasty and outcast crowd in America. It's about the men and the place . They shouldn't put that stupid beep sound to censor the realness of this man . 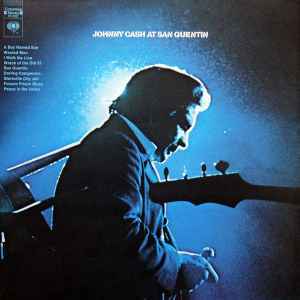 Johnny Cash was real : " San Quentin I hate every inch of you ! " My copy has similar matrix/runout etchings and stampings, but has the "Arr. : J. Cash" on B4. Does anyone have a copy where Peace in the Valley is not listed on the front, not on the back cover track listing? It is listed on the center label for side 2 as "Peace in the Valley -Arr. : J Cash-. Center label is red with two eye, 360 sound designation. Stamped side 1: XSM139760-1G, Etched side 2: XSM 139761-1B. Paper columbia records inner sleeve ("Here's How Records Give You More Of What You Want:"
Great pressing ! Nice blue vinyl ! I am happy. The label on the B side of my copy has a label from a completely different LP, it says: Wynton Marsalis. Black Codes (From the underground) instead of the Johnny Cash LP info. !!! Are all versions of this release cencored with 'bleeps' on some words?